TDR | Mainline Conveyor Systems, Inc. 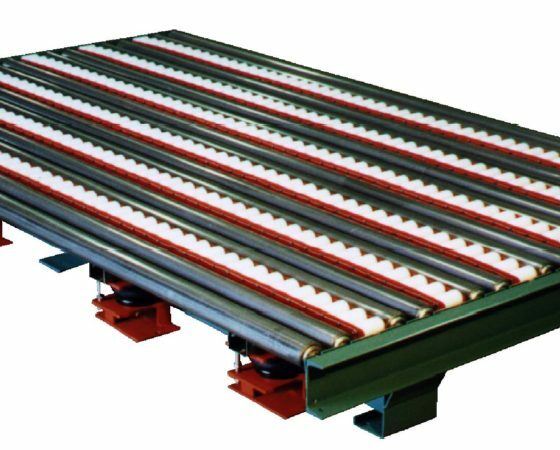 The roller transfer device (TDR) is a bidirectional transfer device that facilitates load transfer to or from adjacent perpendicular conveyors on either side of the device. These devices include spaced racks of nonpowered rollers that raise the load and support it during lateral transfer to or from the device. Air actuators are used to raise and support the device and load, and are usually operator controlled by means of a foot valve located near the intersection. Loads are moved to or from the device in the raised position by the operator’s manual effort. @2016 Mainline Conveyor Systems, Inc.